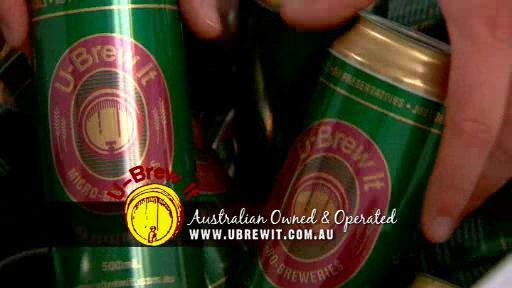 U-Brew It is a brew on premises business which has revolutionised the brewing experience for beer lovers across Australia. Brew on Premises describes the process where customers come into the brewery to choose a brew, create the brew using all natural high quality ingredients, leave the brew in our temperature controlled fermentation rooms for us to care for. They then return to can, bottle or have their beer transferred to a keg or kegs. Although, no experience is necesary, it appeals to people who like the idea of homebrewing, but don't want the hassle of doing home brew or are disappointed by the results. 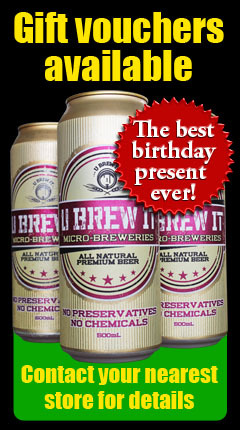 You can be assured of a consistent, high quality, commercial grade beer from U-Brew It! Established in Perth Western Australia in 1998 by Peter Hodyl and Geoff Pelham they had a vision that the people of Western Australia, like them, would love the opportunity to drink any style of beer they liked without being restricted by the cost and availability. Opening their first store in Malaga using state of the art 'Cask Brewing' equipment, premium quality international ingredients, tried and tested recipes, they proved the very best beer can be produced in a micro-brewery environment. After experiencing success in Western Australia, U-Brew It soon after opened stores in Queensland, closely followed by Victoria. 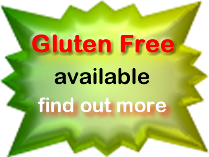 We have hundreds of tried and tested easy to follow recipes. We provide commercial quality, easy to use equipment. We source all natural, fresh ingredients at ultra competitive prices. We keep our facilities and equipment clean and sterile for your health and a quality beer. We have plenty of space to brew and socialise. We have a filtering system that gives you a crystal clear product. We have a gassing system to ensure a refreshing drinking experience. We provide bottling, canning or kegging equipment. We have friendly staff with the 'know how' to help you along every step of the way. We've provided plenty of info on the Brewing Process, Canning or Kegging and also our Range Of Beers, so follow the links here or on the main menu if you are interested in finding out more. Alternatively give your nearest franchise a call and they'll be happy to answer any questions. All of the U-Brew It franchisees are totally committed to their business, quality brewing and to making your experience a truly enjoyable one so get involved and 'JOIN THE BEER REVOLUTION'. Also check out the new kegerator system available to experience your own beer on tap at home!